After having Monday off, this week was just the same ol' same ol'. Work. Come home. Clean. Eat. Sleep. Repeat. I so didn't take any pictures this week. But earlier in the week, we got a little something special from IKEA. 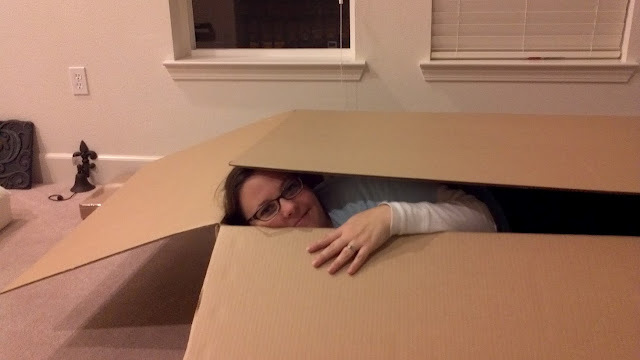 It's actually a box that held a big blue comfy chair for our new house. :) It is big enough to hold a Kristina. Our new Ektorp chairs from IKEA. Aaron had an Ektorp couch when he lived in his bachelor pad in Campbell. We really contemplated whether or not to sell it -- we loved it so much. 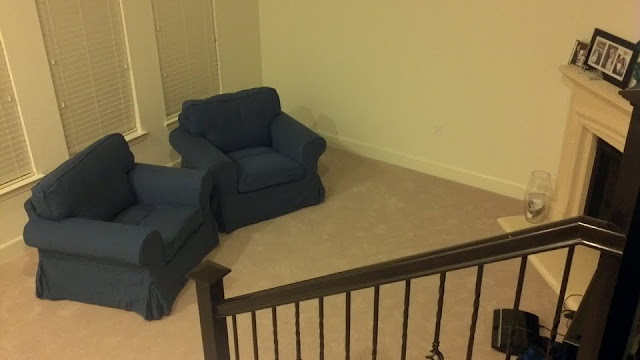 :) So when it came time to buy another couch, or chairs, or whatever, we knew what we wanted. And the best part was that the slipcovers were on sale! The chair is normally $249. No deal there. I doubt these popular chairs ever go on sale. They have a variety of slipcovers for them. We know we didn't want the cheap $20 white one, there was already enough white in our new place. But these blue slipcovers were normally well over $100, and we got them on sale for cheap! :) Woo hoo! Yay for super awesome IKEA deals! P.S. Did you notice my cute little fav icon up there in your webpage tab? I made that this weekend. Isn't it cute!? Just in case, it's too hard to see here is another glimpse. Now my blog has stars upon thars.